How to add favicon in your asp-net site? Appeal from the dreamer - read below please. My dream is to help a school in an extremely remote village of Western Nepal to buy and install a solar system, batteries, inverters, computers and printers necessary for the school for its computer lab and e-library. The school was built with support from local people and some of the colleges and students of Kathmandu. Lalu village where the school is located lacks basic infrastructure, however with the local people driving it, the school is a vehicle to bring the community into the 21st century. The school has very innovative ideas that make it unique. Firstly, Modern Model Residential School is a rural based purely service oriented co-educational English medium primary institution registered as Non-profit Distributing Company. Secondly, it strives to be a progressive institution that acts as a hub for the community, imparting education mixed with modern technology. Using a pro-rata system the school is able to provide quality education to people of the entire community. Orphaned, disadvantaged or disabled students and families are admitted free of charge, whilst others contribute as little as $3 per month. This shows how even a small amount can change not only the students’ lives but their families and the entire community. Kalikot is amongst one of the world's most impoverished areas. “57% of people in Kalikot district live under extreme poverty. Per capita income lies at Rs. 6000 (around $ 83) per year and average life expectancy remains at just 42. Only 57.27% of children are literate where as overall literacy rate is at just 38.47%. Still 45.95% of children involve in some kinds of economic activity instead of going to school.” -Central Bureau of Statistics of Nepal, District Profile, Kalikot 2008 AD . Please don't forget that your single click can make it happen. Time is too short to stop and think. Help to realize the dream and be proud of it! Click Solar and Computers to a School in Rural Nepal to vote! Yes, programmers too can be social workers! How to get the software? How to use this? Yes, it is very easy. Watch the video on how to capture video from your desktop and you are easy to begin! Why this post? Any open source products like this one is a great contribution to the whole world. So this just a give-back to the great effort. I have just tried to spread the word. Could you please do the same? Thank you! More often programmers need to work with dropdownlist or combobox using jquery. We need to manipulate the dropdownlist options using jquery scripting. And it is the case that almost always we don't remember how to implement jquery selector. And for all of my readers, who are enthusiastic programmers and/or designers, and for myself, I am discussing in this post the actions with jquery to manipulate asp.net dropdownlist options. Now append another option using jquery. [Why am I using the selector syntax $('[id$=ddlTest]') instead of $('#ddlTest')? We use #ControlID to select a control with specified id. $= means 'select a control whose id ends with specified value. If you are using master page, the rendered id of the dropdownlist is preceded with some text.] Now get the selected value from the dropdownlist. Now get the selected texct from the dropdownlist. Now, select a value programmatically. And I hope you are comfortable with detecting through jquery when the use selects an item. Good luck! I just got irritated to see the file menu in visual studio 2010 missing. All other items of the menu, e.g. Edit, View, Refactor, Project, Build etc. were showing. Only mischievous was the File item. It would be of no value for me if only I could add new project in an existing project. But I couldn't find any such option. I had to workout to recover my lost menu item back. And the way is as discussed below. 1. Run Visual Studio Command Prompt for VS2010 as Administrator 2. Navigate to C:\Program Files\Microsoft Visual Studio 10.0\Common 7 3. Run devenv with the option /ResetSettings 4. Press enter This will reset the default settings for the visual studio and open it. Now you see the missing File item. Thanks. When a user clicks a button and the response is slow, there are chances that user may click the button again. The scenario may occur both when the button postbacks synchronously or asynchronously. This type of multiple clicks could be prevented if we could just disable the button just after the first click and enable it again when the processing is done. This is quite easy to implement the task in both the cases: synchronous and asynchronous postbacks. Before we jump on the topic, you may learn how to click a button on enter key press in an asp.net textbox control. Similarly you may be interested in displaying google search-like watermark in an asp.net textbox control. Both the tutorials help you work with asp.net button control more interactively. If you are using ajax processing on button click, just disable the button when it is clicked and enable it when the ajax processing is done. If you are using full postback on button click, you may just make the button invisible using client-side-scripting when the click occurs. And you don't need to worry about making it visible since after postback the page will be rendered again, with the button visible as usual. In the snippet below I have shown how to 'disable' (in fact disabling won't work since the server side event is not firing) the asp.net button from client side when it is clicked. lblMsg.Text +="Current time : "+ DateTime.Now.ToLongTimeString()+"
That's all. When you click the button you catch the client side click event and make the button just invisible. Meantime show 'processing' or similar message. If you love ajax loading image, generate one and show it. From codebehind I have just displayed current time in a label. Happy Bijaya Dashami (Dashain - the greatest festival of Hindus)! Note that we run the commands against the master database, not the candidate database itself. And did I do the same last time? Nope. I was just happening with a slight mistake. I had created users for the db before I restored the database. So to save yourself from all those stuffs explained above, just create the database in the server, restore your backup file to it and only then create the database users. Done! Thanks. 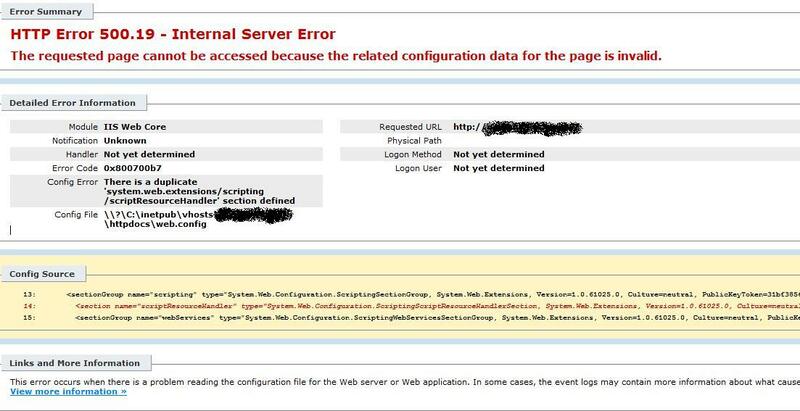 See in the image below the following config error, and also watch the config source. I got the error when I was deploying a web application precompiled in asp.net 2.0 onto the production server with asp.net 4.0. The simple search reveals that it is known issues with VS 2010 and asp.net 2.0. But my site is asp.net 2.0 enabled. What's the root of the error then? My conclusion (and please correct me if necessary) I have configured asp.net web extension namespaces in my web.config file. You don't see this in asp.net 3.5 and 4.0 enabled sites since servers with asp,net 3.5/4.0 by default server asp.net ajax services. But asp.net 2.0 has to be ajax enabled by installing asp.net ajax extension 1.0 which you can download from here. Sensed duplicate entry of system.web.extension section group? Yes, don't include the following section group in the config section if your site runs on asp.net 2.0 but published on asp.net 3.5/4.0. Comment out the config section (or remove it if you like), and you are done. Good luck! Make your site impressive and standard by displaying favicon. This is a practice of branding also. See in the following image the red circled area at the top corner. The black filled square is the favicon of dotnetspidor: A dot net programming blog. You can see the favicons in almost all of the popular websites. So how to achieve this? First create a favicon image of your own. Visualize a great logo/image for the favicon. Save it as favicon.ico. Drop it at the root folder of your site. Now you are one step away - just put the following two links just below the title of header of your form. If you are using master page, just put these lines in the master page and you are done for all the pages. So why the two lines? Normally the first link works. But for some tricky and picky browsers the second link will work. All the best! Example? See the way you edit a section in your blogger blog site. When you are logged in and browsing your blog, blogger lets you edit sections of your blog page directly from the public page of your blog. When you click the edit icon, a window will pop up and load with the setting of the editable section. Now when you save your changes the pop up window will close itself and the parent page (your public page) will be refreshed. Want to implement the same? 1. Program your parent page to open new window : You can place a hyperlink in your parent page. There are other several ways to open new window in asp.net web page. 3. Sometimes your child page is a page loaded in iframe from your parent page. In that case it will be a bit different than what I have mentioned in (2). Learn how to refresh parent parent from iframe child page. This is the parent page. Clicking the link will open the child page Child.aspx in a new window. If you wish you can Open the new window in asp.net web page in different ways, which I have already discussed in a previous post. This is the child page. In the child page, I have just put a button. When the button is clicked, the page logic will be implemented (which I have indicated by the comment lines in the event handler of the button in the asp.net child page). Note that all files at the source folder have been copied to the destination folder. But folder and files within them have been copied using recursion - see the function of second foreach construct. Shortcomings? Yes, no exception handling has been done in the snippet. However, the functionality is ok! Thanks to csharp411.com. I have been suggested this happens when my parent page is being rendered within an iframe. But this was not the case for now. I was just using a placeholder to dynamically add the control. So what's the solution? The Page that refers to the Page control containing this dynamic control is achieved through current request handler. This avoids the problem since the request was generated by the page. But mere Page or this.Page or this.Parent.Page or whatsoever might have been missed due to the hierarchy of the controls or is it due to anything else? Hope this helps. Sweet programming!